[prMac.com] Outlook, Washington, USA - Calf Trail Software, LLC has announced the release of Geotagalog version 1.2, an update to their GPS tracklog based geotagging utility. Version 1.2 adds direct support for popular GPS loggers that record in the NMEA 0183 log format, including the AMOD AGL3080 and the new Sony GPS-CS3. Version 1.2 also adds direct support for Garmin's fitness devices via the Garmin Training Center (.tcx) file format. The addition of these two formats to the standard GPX support present since version 1.0 makes Geotagalog's geocoding workflow even smoother. 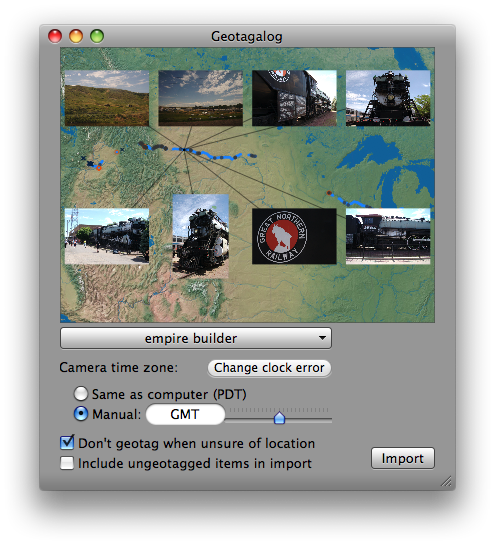 Geotagalog enables precise iPhoto Places support with any digital camera. It automatically combines digital photos with location data from a GPS tracklog from most popular logging devices, showing a live location preview with mouseover thumbnails as the user adjusts camera time settings for better alignment. The improvements in Geotagalog version 1.2 are offered as a free update to existing customers. A quantity-limited demo is available; the full version remains at the introductory price of only $19.95 (USD). Calf Trail Software, LLC was founded mid-2008 by Nathan Vander Wilt and Jon Hjelle in Sunnyside, WA. Calf Trail designs and develops user-focused applications for Mac and iPhone, with a love for making engineering innovations accessible. Copyright 2008-2009 Calf Trail Software, LLC. All Rights Reserved. Apple, the Apple logo, and iPhoto are registered trademarks of Apple Computer in the U.S. and/or other countries. Garmin, the Garmin Training Center and its logo(s) Copyright (C) Garmin Ltd.